Playing in their old gym, honouring Cariboo College teams and going up against a former coach, "Retro night" for TRU volleyball was all about acknowledging the past. Yet the pair of wins secured by the men's and women's teams will help their future, as both inch closer to securing a playoff spot in Canada West. The women WolfPack topped the Saskatchewan Huskies 3-1. After dropping the first set, they stormed back winning three straight sets 25-22, 25-22, 25-15. TRU was once again led by Olga Savenchuk, who had 13 kills on the night. The first year hitter ranks fourth in the conference with 294 kills this season. The game was played in the old TRU gym after scheduling conflicts with the TCC this weekend. The win moves the women to 11-10, tied for sixth in the conference, with three games remaining. 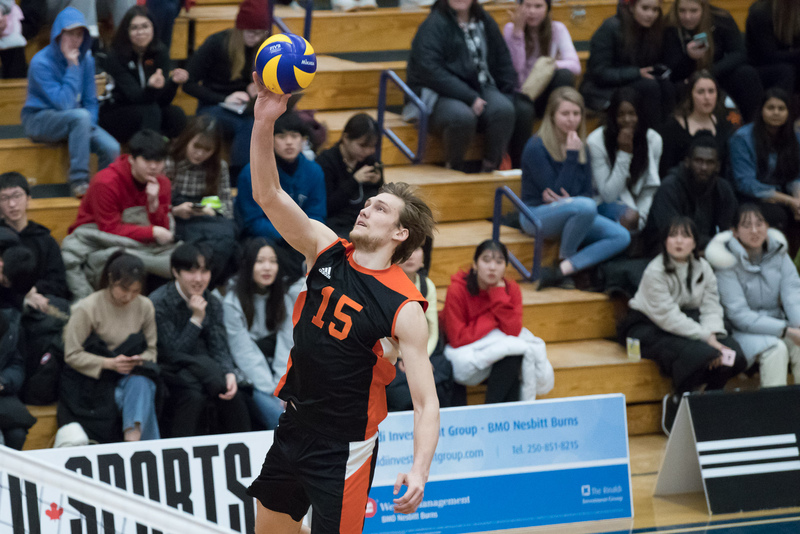 The men's team also topped Saskatchewan 3-1, taking sets 25-19, 25-23,18-25, 25-16. The win came at the expense of former WolfPack assistant coach Nathan Bennett, who is in his first year coaching the Huskies. “I saw a lot of people I haven’t seen in a long time. It was nice to be back in this gym," said Bennett in a release. "My old office was right there. It was a good homecoming but the TRU WolfPack weren’t very welcoming. It was a tough night for us. We struggled from the service line and struggled passing." Tim Dobbert led the way for the WolfPack, adding 19 more kills to his Canada West-leading total of 327. The win sends TRU to 10-9 on the season, tying them for fifth place. The final home game of the regular season goes tonight and will be a send off for five graduating players from TRU. Tim Edge, Isaac Smit, Cole Hanson and Dobbert will all be moving on from the men's program while Carly Gunter will be honoured from the women's team. Gunter graduated last year before the WolfPack had a chance to send her off properly. The women's game starts at 5 p.m. with the men's game following around 6:45 p.m. Both games will be played at the old gym.